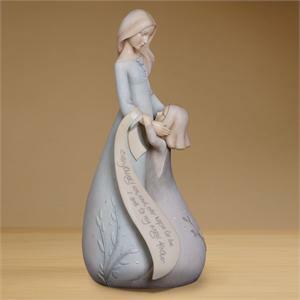 A mother figurine gazing at the daughter. The skirt reads: "Everything I am and ever hope to be I owe to my angel Mother." With the soft blue and pastel colors, exquisitely formed features and loving sentiment this figurine is a wonderful gift. It measures 9" high and has rhinestones sprinkled on the dress for a touch of sparkle. Carved in the round with a soft texture and thoughtful detail.